Welcome to Victoria’s DRAGON ALLEY Live/Work Town home! Located in the heart of Victoria and Chinatown. Not a single detail was missed when this town home was completely renovated top to bottom. Designed as a true live work, the lower level can quickly transform from a bedroom to a storefront, featuring a hidden Italian bed/shelving, kitchenette, 3/4 bath and convenient separate entry. The second floor features a comfortable living room, full kitchen with ample bar seating, and cozy electric fireplace. The top floor is your own oasis with a full Ensuite, another hidden bed and your own balcony. Take the stairs to your private rooftop patio and explore the beautiful views of Victoria. This townhome truly maximizes the entire 989 Sq Ft. with a European design utilizing integrated appliances including a full washer/Dryer, & 2 hidden Italian beds. No expense was spared and is evident with Granite Counter tops, Coconut and Cork flooring, floating stairs, custom Rosewood cabinetry/millwork, faux beams and many more. Surrounded by Restaurants, Shopping, Night Life and Only Minutes To The Galloping Goose Trail with a walkscore of 99 you wont find better urban living. The ground floor offers many options with the Italian resource furniture folding Queen bed, a full bathroom and Kitchenette. Operate as a fully contained one bed rental, Use as an office/client meeting room or keep as a full time second bedroom. The kitchen is custom built with Granite countertops, Rosewood bookmatched cabinetry, Integrated appliances and Coconut hardwood flooring. Separate this private space with a quick slide of the shoji door creating a dream space to relax and enjoy. Attention to detail is what makes this home so special. Enter your second floor and discover perfection, enjoy a full open concept kitchen which flows into a comfortable living room. A space with entertaining in mind, find the raised bamboo butcher block countertop surrounding a beautiful granite topped island. A full sized integrated fridge, and dishwasher provide all the luxuries. Walk upon the cork plank flooring and custom glass blocks that push light to the floor below. Relax in the living room and absorb the ambiance of the fireplace. Arrive at your top floor, an oasis where relaxation is found. The master bedroom features another Italian folding bed that functions as a couch during the day, and a full Queen at night. Steps away is a full Ensuite bath with a sliding glass door, Tub/Shower, Tiled floor, heated towel bar and a glass block wall that allows the natural light to flood the space. A cozy balcony is also found on this level that allows for a comfortable escape to soak up the outdoors. Welcome to paradise! Downtown Victoria living, with your own private rooftop patio, the perfect space to entertain and escape the hustle of life. At over 230 Sq Ft there is plenty of room a patio set, BBQ and many friends. Ideally positioned, this rooftop patio has both east and west exposure, maximizing your sunny days! 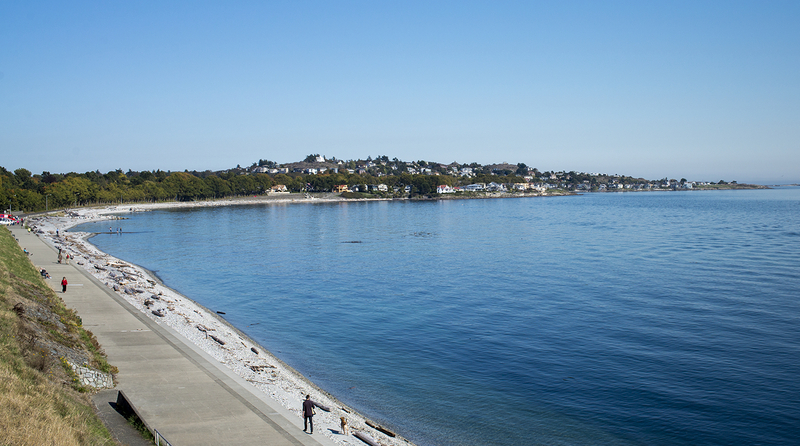 Victoria has a wealth of natural and man-made riches, including stunning heritage architecture, ocean views and mountain vistas. It is this rare juxtaposition of heritage charm, scenic backdrop and modern city-scape that makes Victoria one of the most uniquely special places in Canada. Millions visit our city every year and enjoy the natural beauty, temperate climate and heritage charm Victoria offers its citizens every day. Located in sub-Mediterranean zone, Victorians enjoy some of the most moderate weather in all of Canada. Victoria boasts an average of 2,193 hours of sunshine yearly, and an eight month frost free season. Average annual rainfall is 58.3 cm (23 inches compared to over 50 inches in New York). The average monthly rainfall in winter is 8.5 cm (3.35 inches) and in the summer averages 1.83 cm (0.72 inch). Victoria has a very low humidity ratio, and almost constant offshore breezes which keep summer days from becoming too hot, yet summer evenings can cool off; therefore a sweater or a light jacket is recommended. Although winters are mild and rarely include snow, warmer clothing is recommended between the months of November and March. Greater Victoria’s health care needs are served by Island Health ( formerly Vancouver Island Health Authority). Island Health provides services through a network of hospitals, clinics, centres, health units and residential facilities. Across the Island, more than 17,000 health care professionals, technicians, and support staff provide excellent care and services. For more information on hospitals and health services in Victoria visit the Island Health website. Victoria is Western Canada’s second oldest city, incorporated as a City on August 2, 1862. On March 13, 1843, Chief Factor of the Hudson’s Bay Company James Douglas, accompanied by the pioneer Roman Catholic missionary Father J.B.Z. Bolduc, anchored off Clover Point in the “Beaver.” The next day he selected the site for Fort Victoria. By mid-June, Chief Factor Charles Ross was busy at work constructing the new post. Anticipating that under the Oregon Treaty, then being drawn up, the 49th parallel would be chosen as the International Boundary Line, the Hudson’s Bay Company moved its fort from Vancouver on the Columbia River to the southern end of Vancouver Island. Thereafter, for a short time, it was known locally as “Fort Albert,” but by resolution passed by the Council of the Northern Department of the Company meeting at Fort Garry on June 10, 1843, it was officially named “Fort Victoria” after the great British Queen. To buttress the British claim north of the 49th parallel, the Hudson’s Bay Company, by Royal Grant dated January 13, 1849, received title to the whole of Vancouver Island, but only on condition that colonization should be undertaken. By midsummer, Chief Factor James Douglas was in residence at Fort Victoria to begin this task, with the assistance of his colleagues in the fur trade. Constitutional history began in 1849 with the creation by the Imperial Government of the Crown Colony of Vancouver Island and on March 11, 1850, Richard Blanshard formally assumed office as Governor of the Colony of Vancouver Island. It was a wintry day, but every effort was made to make the ceremony as impressive as possible, including a salute from the seventeen guns of H.M.S. Driver and an answer from the bastion guns of the fort. All available British residents and a complement of sailors from the “Driver” were assembled in front of the fort to hear the newly-arrived Governor read the Royal Commission, appointing him the first Governor of the first Crown Colony to be established in British territory west of the Great Lakes. The life of the little community of Victoria, numbering approximately 230 men, women and children in 1854, centered in the business of the Hudson’s Bay Company until 1858 when gold was discovered on the mainland of British Columbia. Then miners and adventurers from the gold fields of California and Australia, and indeed from all parts of the world, flocked to Victoria which was the only ocean port and outfitting centre for the gold fields of the Cariboo. The first ship bringing these modern argonauts, the “Commodore” – a wooden side-wheel American steamer, entered Victoria harbour on Sunday morning, April 25, 1858, just as the townspeople were returning homeward from church. With astonishment, they watched as 450 men disembarked – typical gold-seekers, complete with blankets, miner’s pans and spades and firearms; and it is estimated that within a few weeks, over 20,000 had landed. The gold rush was on in earnest and the quiet of Victoria shattered forever. Overnight, as it were, a city of tents sprang up around the fort and quickly spread out over both sides of James Bay. While the great majority of these people were only transients, the rush of gold-seekers on the way to the diggings on the Fraser River suddenly transformed “Fort Victoria” from a sleepy village into a bustling commercial centre. A wild land-boom followed, and one reads of city lots that were going begging one day at $25 apiece, being eagerly snapped up a week later at $3,000 each. Parliamentary government in British Columbia dates back to August 12, 1856, when Governor James Douglas convened the first Legislative Assembly of Vancouver Island within Fort Victoria. In 1859, government buildings were constructed at James Bay, south Fort, and christened “The Birdcages.” In continuous use for almost 40 years (except for the brief period 1866-68 when New Westminster, not Victoria, was the capital) they were replaced in the 1890’s by the present Parliament Buildings, completed late in 1897. The formal opening took place on February 10, 1898, when Lieutenant Governor R.R. MacInnes drove up in his carriage to open the first session of the Provincial Legislature to be held in the new buildings. The name “Victoria” was adopted when the townsite was laid out in 1852. Victoria was incorporated as a City on August 2, 1862. Mr. Thomas Harris was elected (by acclamation) as Victoria’s first Mayor on August 16, 1862, and he presided at the City Council’s first meeting held on August 25, 1862. With the waning of the gold excitement, the continued separate existence of the Crown Colonies of Vancouver Island and British Columbia became costly and impractical. Early in August 1866, an Act for the Union of the colonies was passed by the Imperial Parliament. It became effective at noon on November 19, 1866, when it was proclaimed simultaneously in the two capitals. In Victoria, there was no rejoicing, and in New Westminster only a “small knot of people” gathered in front of the government offices to hear the Acting High Sheriff of British Columbia, J.A.R. Homer, read the proclamation. Not a cheer was raised. In the twentieth century, Victoria evolved primarily as a city of government, retirement and tourism. The City remains, however, Canada’s western naval base and home to a major fishing fleet. Ship building and repair, as well as forest products and machine manufacturing industries, continue as significant sources of employment. Increasingly, the city is developing as a marine, forestry and agricultural research centre. 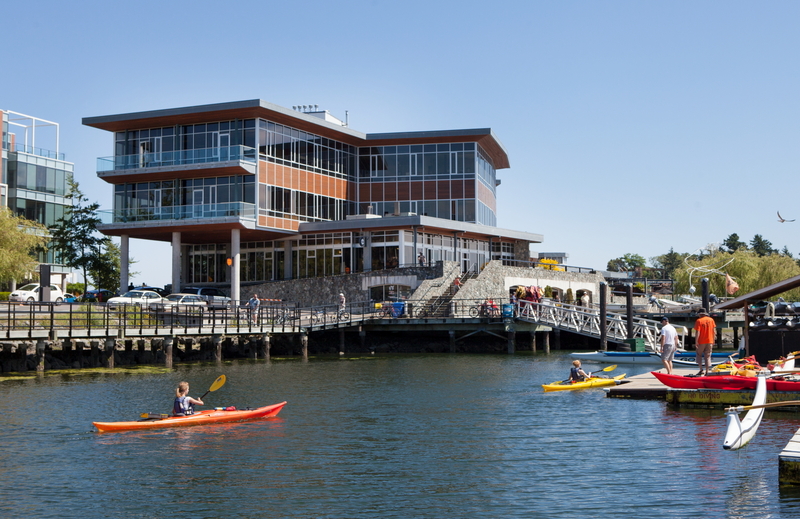 The City is also noted for its fine educational institutions which include the University of Victoria, Lester B. Pearson College of the Pacific (one of only six in the world operated by United World Colleges), and Royal Roads University. In a survey conducted by Conde Nast Traveller magazine, Victoria was judged to be one of the world’s best cities, topping the list in the category of environment and ambience. In a cross-Canada survey, Victoria residents registered the greatest satisfaction with their city. This satisfaction and regard for the quality of life and the environment is perhaps the most notable feature of Victoria today. The City of Victoria is currently building the fourth crossing between downtown Victoria and Victoria West. To learn more about the three previous bridges and history of the crossing, visit the Johnson Street Bridge Project website.